Howl-O-Scream returned for its 17th season in 2016, with Evil Encore as the theme. The event featured seven haunted houses, two of which were new for the season. The popular show Fiends also returned. Mr. Karver put his heart and soul into his dolls. After the authorities came to close him down, Karver locked himself in his “Hall Of Dolls” and burned it to the ground. Now, the dummies are back and they insist the show must go on. It’s the encore no one asked for, and it’s about to bring down the house, forever. It’s the Evil Encore everyone is dying to see. 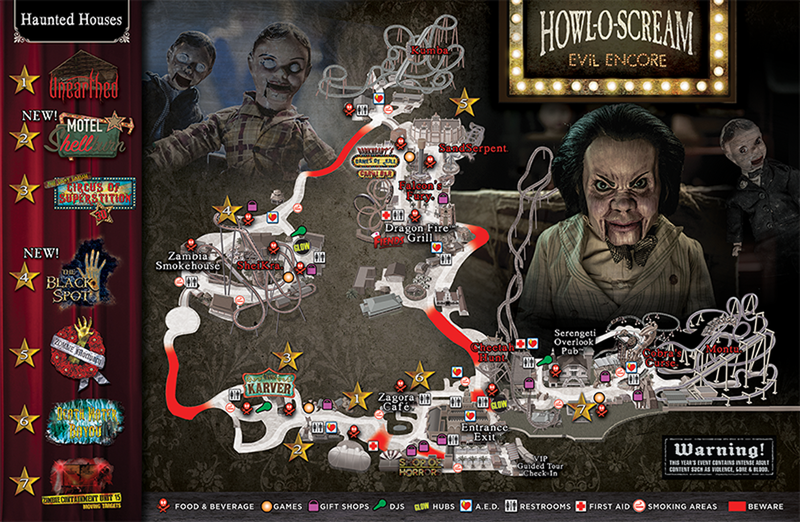 Instead of designated scare zones, the event featured “Inescapable Roaming Hordes” that could pop up to terrorize guests anywhere in the park, although the map did feature seven designated areas where you were most likely to see them. In addition to the earlier ticket deals, Howl-O-Scream 2016 also featured a 4-Pack Ticket Deal starting at $35.99 per person. Howl-O-Scream 2016 ran for a total of 21 nights, with hours of 7:30 p.m. to 1 a.m. Freaky Preview weekend was on Friday and Saturday, September 23 and 24, and the event then ran each Thursday through Sunday from September 29 through October 30, 2016. Additional details and images on Howl-O-Scream 2016 will be added in the future.